I have a four year old and a two year old at home. That means, at meal times, it’s often much easier to eat finger foods than foods covered in sauce because, inevitably, the sauce gets spilled all over the place. Thus, we’re often seeking recipes for meals that can easily be eaten by hand, are still reasonably healthy, and have a low cost. 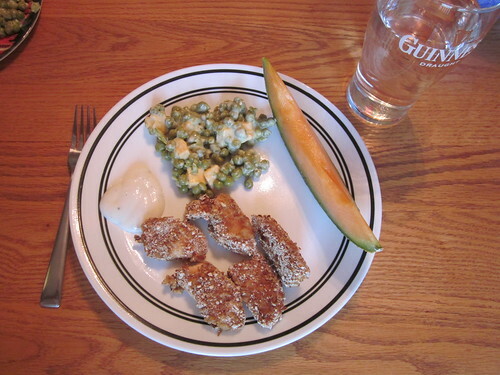 One popular one at our house is homemade chicken strips, which turn out to be quite inexpensive and very easy to prepare. 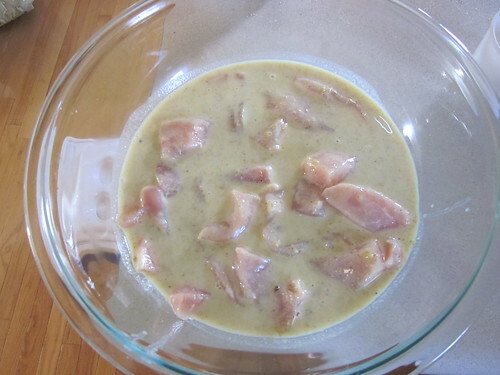 The variation I’m going to show you today is honey mustard strips, but you can make infinite variations on this recipe by just changing up the spices as you see fit. From left to right, you’ll see vinegar, skim milk, black pepper, spicy brown mustard, chicken breasts, honey, and pretzels. 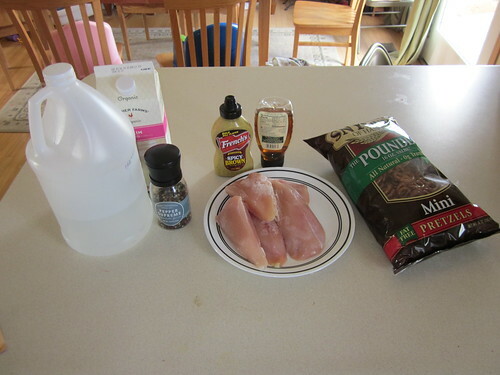 This is all you need to make some very good chicken strips. Each batch produces 10-12 strips or 20-24 half-strips, depending on how you slice them, so the cost per strip is about a quarter. In other words, the cost of one of these delicious and healthier homemade half-strips is actually less than a Chicken McNugget ($3.29 for 10 pieces, or thirty three cents a pop), and a full strip ($0.50 or so) is way less than the comparable McDonald’s Chicken Select Strips (3 for $3.99, or $1.33 a pop). 1. Put half a tablespoon of vinegar into a 1/2 cup measuring cup, then fill it with skim milk. Stir and let sit for 10-15 minutes. This creates what one might call a healthier substitute for buttermilk – it gets a little thicker and stickier, too. 2. 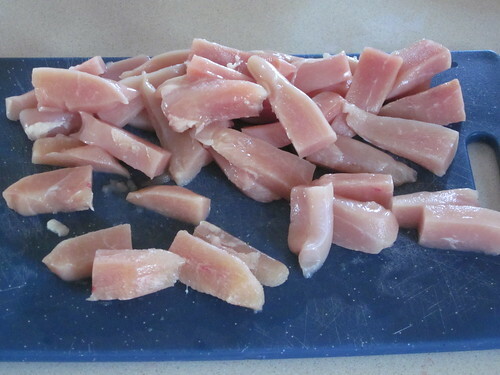 Slice up the chicken breasts into strips or pieces, however you like. (We’re making a double batch so we have plenty for freezing and leftovers, but you can clearly see that I basically just cut long strips, then divided them in half. This would get us about 20-24 pieces per pound of breast, or 40-48 over two pounds (what you see above). 3. Start crushing the pretzels. I just put a bunch in a baggie, get out a rolling pin or a hammer, and smash smash smash! The baggie keeps crumbs from flying everywhere. Just keep doing it until you have a cup of crumbs. 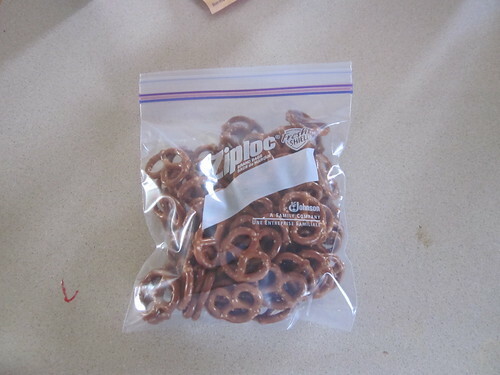 Another method would be to put them in a blender and puree the pretzels. I don’t like doing this because I usually wind up with pretzel dust in the air, causing me to sneeze. The baggie method generates a little dust, but not nearly as much. You can crush them finer (it’ll make more of a breading) or less fine (it’ll make more of a crunchy surface), whichever you prefer. We do a mix, which makes a breading with some crunchy pretzel pieces hanging on. Once you have those pretzels crushed, sit that bowl aside. 4. 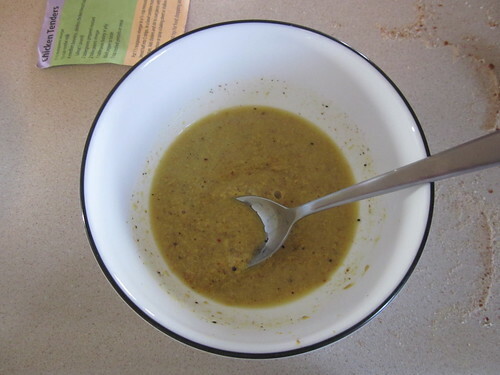 Mix the remaining two tablespoons of vinegar, the mustard, and the honey together in another bowl and add any amount of black pepper you’d like. Naturally, you can alter this mix however you’d like. Substitute the honey and mustard for ranch dressing if you’d like. Use barbecue sauce instead. Blue cheese dressing. Whatever flavor floats your boat. 5. 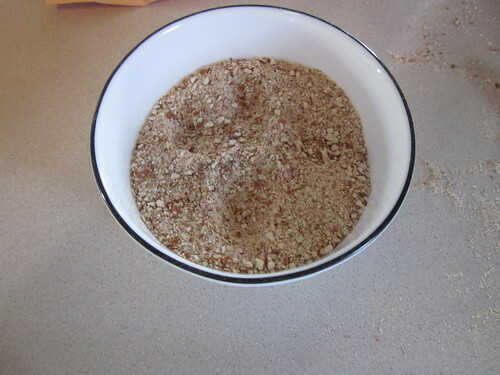 Once you have this mixed together, mix in the vinegar-milk mix you made at the start. You’ll end up lightening the color of your mix. 6. In a larger bowl, put the chicken strips and pour the mix you’ve made on top of it. 7. Once that’s ready, let the strips soak for 20 minutes. Go do something else. Finish crushing your pretzels. Make lemonade. Play catch with your kids. 8. Preheat your oven to 400 F (about 200 C). 9. One strip at a time, take the strips out of the liquid stuff and toss the sticky, wet strips around in the pretzel crumbs. 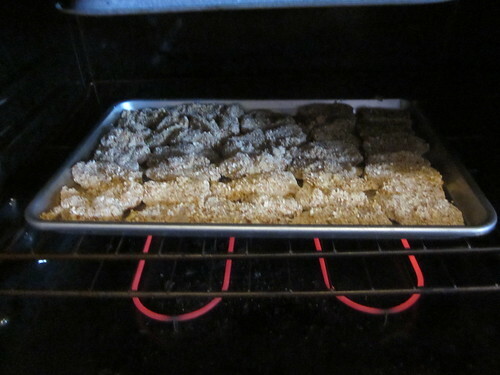 The pretzel crumbs will stick quite well to the wet strips. When they’re coated, lay them on the sheet and repeat until you’ve coated ’em all. 10. Toss the strips in the oven for about 10 minutes. 11. Pull out the strips and flip them over. It’s easy to do with a spatula. The reason for doing this is that if you do not, they can be a touch soggy on the bottom, so you can get away with not flipping them and they’re still just fine. 12. Put the strips back in for another 10-12 minutes. Take them out and serve them however you like! Yum! They were quite tasty and a real hit – all four of us enjoyed the strips. Along with the strips, we had leftovers – some leftover pea salad (mostly peas, but with some diced celery, cubed cheddar cheese, and sour cream) and leftover cantaloupe from a Memorial Day weekend barbecue that we hosted. The nice thing about strips like this is that almost anything you have on hand works as a side dish for them. Virtually any vegetable and fruit works alongside the strips. This makes the meal less expensive because you can use leftovers (as we did) or whatever fruits and vegetables are on sale at your local grocery store. Next time, we’ll look at the grill – and the frugal beauty of grilled vegetables.